Review: 2014-10-04, fight not so exciting between Adrian Estrella and Celestino Caballero: it gets two stars. The undefeated Adrian Estrella entered this fight with a perfect record of 18-0-0 (17 KOs=94%) and he is ranked as the No.9 super featherweight in the world (currently the #1 in this division is Mikey Garcia), he has already fought three times in 2014 beating Dante Jardon in his last bout (=Jardon vs Estrella). His opponent, Celestino Caballero, has a record of 37-5-0 (24 knockouts) and he entered as the No.6 featherweight, he has won world titles in two different weight classes while Estrella has never fought for a world belt: ‘Pelenchin’ Caballero fought twice in 2013 losing to Robinson Castellanos (Caballero vs Castellanos) but then he came back to win against Jimmy Aburto. 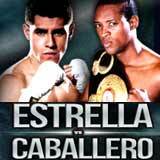 ‘Diamante’ Estrella vs Caballero is valid for the WBC Fecarbox super-Fw title; undercard of Jhonny Gonzalez vs Jorge Arce. Watch the video and rate this fight! Review: 2011-12-31, pretty fight between Celestino Caballero and Satoshi Hosono but it is not enough to get our three stars (fight ended by unanimous decision). Celestino Caballero (35-4-0) entered as the No.4 featherweight in the world while Satoshi Hosono (21-1-0) entered as the No.12. Caballero vs Hosono is valid for the WBA featherweight title (Caballero’s first defense); undercard of Takashi Uchiyama vs Jorge Solis. Watch the video! 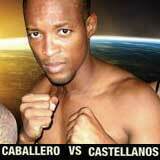 Review: 2011-10-14, good fight and pace between Jonathan Victor Barros and Celestino Caballero. In their first fight Barros won by split decision but this time “Pelenchin” Caballero takes revenge on the Argentinian winning by unanimous decision. Jonathan Victor Barros (33-1-1) entered as the No.7 featherweight in the world while Celestino Caballero (34-4-0) entered as the No.9. Barros vs Caballero 2 was valid for the WBA World featherweight title. Watch the video!